I know that we have different preferences when it comes to travel, some prefer long-haul flights, road trips and food trips. Well, for us to have a memorable and such enjoyable trip, we should be healthy and worry-free from sickness. We have to make sure and be ready whenever we go on trips so it is necessary to have yourself some meds to be ready. United Home Ceetab (Ascorbic Acid) helps promote immunity against sickness. United Home Dizitab (Meclizine HCl) provides relief from dizziness/motion sickness. This is advisable for long-haul flights and road trips. United Home Supracid (Sodium Bicarbonate) this provides relief from hyperacidity so basically a big help for those who'll go on food trips. 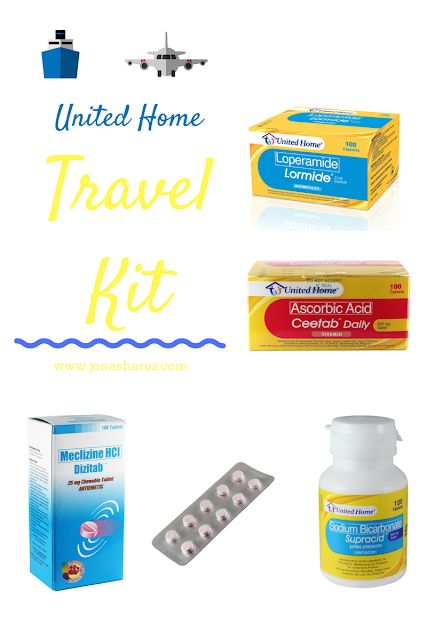 United Home Loperamide (Loperamide) is for being ready in case diarrhea or LBM attacks, hahhaha. United Home offers quality-proven products from Unilab at an affordable cost. Below are the list of the products prices.